SV90T. Illustration courtesy of Stellarvue. 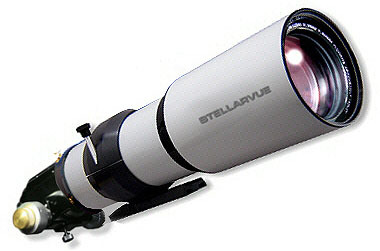 The Stellarvue (www.stellarvue.com) SV90T 3.5" refractor is about as sophisticated as a short focal length refracting telescope can get. Its objective is an ED triplet. The main tube is heavy gauge, machined, seamless aluminum. It is internally blackened and fully baffled. The white external finish is powder-coated. The telescope is supplied with an aluminum retracting dew shield, Stellarvue's 2" two-speed Crayford focuser, front and back caps, clamshell mounting bracket with Vixen rail and heavy duty C7 case. A dual-speed 2" Feather Touch reverse Crayford focuser is optional at extra cost, as are red dot finders, optical finders, various Stellarvue alt-azimuth and Celestron go-to equatorial mounting systems. No star diagonal or eyepieces are included with the telescope. SV90T's are individually hand assembled and collimated. Stellarvue's Vic Maris personally star tests every one. This relatively modest aperture telescope seems to have hit a "sweet spot" and is, in fact, one of Stellarvue's most desirable telescopes. The SV90T reviewed here was purchased with a Feather Touch dual-speed focuser. For this review we mounted the scope on a Stellarvue M3 alt-azimuth mount and aluminum surveyor's tripod. The M3, although discontinued, is a very stable, versatile and easy to use AZ mounting system. We had a variety of high quality 1.25" and 2" oculars available from Stellarvue, TeleVue, Pentax and others. We also had Stellarvue 1.25" and 2" dielectric star diagonals to match. We took the SV90T to a Eugene Astronomical Society star party at Dexter Reservoir Park, a semi-dark sky site east of Pleasant Hill, Oregon. The weather was clear and mild, with some dew later in the evening and moderate light pollution. Seeing conditions were about 3 out of 5. A quick star test verified the scope's perfect collimation. For comparison, we brought along a Celestron C8 Starbright XLT (8", 2032mm SCT) and a Meade ETX-90 (3.5", 1250mm Maksutov-Cassegrain). Other EAS members present were using scopes from 4" to 20"+ aperture. Note that this review is not intended to be a comparison test; our C8 and ETX-90 were present simply to serve as known references. The SV90T impressed us and everyone who looked through it, from beginning to advanced observers, with its optics and performance. It is clearly a state of the art 90mm refractor. Both the scope and its associated accessories show a commendable commitment to design and manufacturing excellence. We were able to view several common astronomical objects over a period of several hours. The best known of these included the Andromeda Galaxy (M-31), Hercules globular cluster (M-13), Double Cluster (NGC 869 and NGC 884), Lagoon Nebula (M8) and the planet Saturn with its spectacular ring system. We split the spectacular gold/blue double star Albiero, at the foot of the Northern Cross. The SV90T showed all of these objects to good advantage. Its wide sky potential, with suitable focal length oculars, and the prevailing viewing conditions allowed it to outperform the much larger C8 and the longer focal length ETX-90 when we viewed the Andromeda galaxy. It was able to show the pale gold and pale blue colors of the two component stars of Albireo. The globular cluster M-13 was impressive, with many individual stars resolved well into the core. The open Double Cluster was spectacular, one of the most beautiful sights in the heavens through a razor sharp, wide-field telescope like the SV90T. To summarize our impression of the SV90T, it provides superior views of astronomical objects of all kinds, the best that we have seen through any 90mm aperture telescope. This small telescope is suitable for serious observing. It is an outstanding "quick look" telescope and equally useful for the traveling astronomer. Its quality, simplicity and low maintenance would make it an outstanding first telescope, but its high price probably puts it beyond the budget of most entry level hobbyists. It usually takes an advanced amateur to appreciate (and pay for!) a telescope like the SV90T. If you are in the market for a physically small refractor with great optics, the Stellarvue SV90T deserves serious consideration. Copyright 2011 by chuckhawks.com. All rights reserved.